The first Queen’s Baton was created for a relay to celebrate the Cardiff 1958 Commonwealth Games in Wales. Since then the Queen’s Baton Relay has become a much loved Games tradition. The baton’s journey symbolises the unity and shared ideals of the Commonwealth of Nations, and enables communities beyond the host city to share the Games celebrations. It also serves a functional purpose in carrying Her Majesty’s ‘message to the athletes’ from Buckingham Palace in London to the opening ceremony. The Melbourne 2006 Queen’s Baton Relay was the world’s longest, most inclusive relay – travelling to all 71 nations of the Commonwealth in a year and a day. The design and technological features of the baton that travelled this epic journey reflect the relay’s efforts to showcase the diversity of the Commonwealth and unite its communities in celebration of the Melbourne 2006 Commonwealth Games. The elegant, curved form of the baton took its inspiration from the physical form of athletes arching forward as they strive for success. 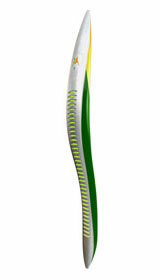 The 71 larger lights on the front of the baton indicated the 71 nations of the Commonwealth that the Queen’s Baton visited on its journey to the Games. These progressively lit up as the baton arrived in each Commonwealth country, symbolising the gathering of the nations at the four-yearly festival of sport and culture. The gold and magnesium used in the baton hold special significance to the people of the State of Victoria, of which Melbourne is the capital. The gold tip reflects Melbourne’s elegance and grandeur and the important role the metal has played in the city’s history and prosperity. Melbourne thrived during Victoria’s 1850s gold rush, which drew many people from diverse nations to the great city to seek their success; not unlike the athletes that will flock to Melbourne for the Games in 2006. The Melbourne 2006 Queen’s Baton, its interactive web-based and lighting technologies and all other associated products were designed by Melbourne-based industrial design and product development consultancy, Charlwood Design Pty Ltd in partnership with several other Victorian companies. The Queen’s Baton Relay harnessed the very latest in digital and other communication technology to enable people across the globe to join the baton on its epic journey to the Opening Ceremony of the Melbourne 2006 Commonwealth Games. baton cam – cameras mounted in the baton transmited video footage of key relay moments to this website.